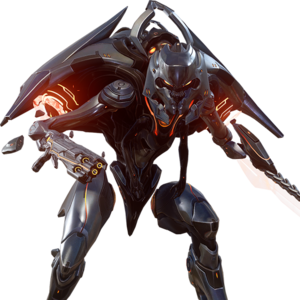 Knight Marshals are a class of Promethean Knight present within the UNSC's Warzone simulation. In Warzone simulations, Knight Marshals have the same appearance as a Knight Battlewagon, thus Marshals have the hardlight blade they do, the same carapace, and sports a grey color scheme. Marshals have the same hard light blade as the Knight Lancer variant in Halo 4. Marshals appear in Warzone as a boss unit, capable of sustaining much more damage before dying. Killing one will award the team 25 VP, and earn the player a Boss Takedown medal. A Knight Marshall on Escape from ARC. A Knight Marshall and a Watcher on Escape from ARC.